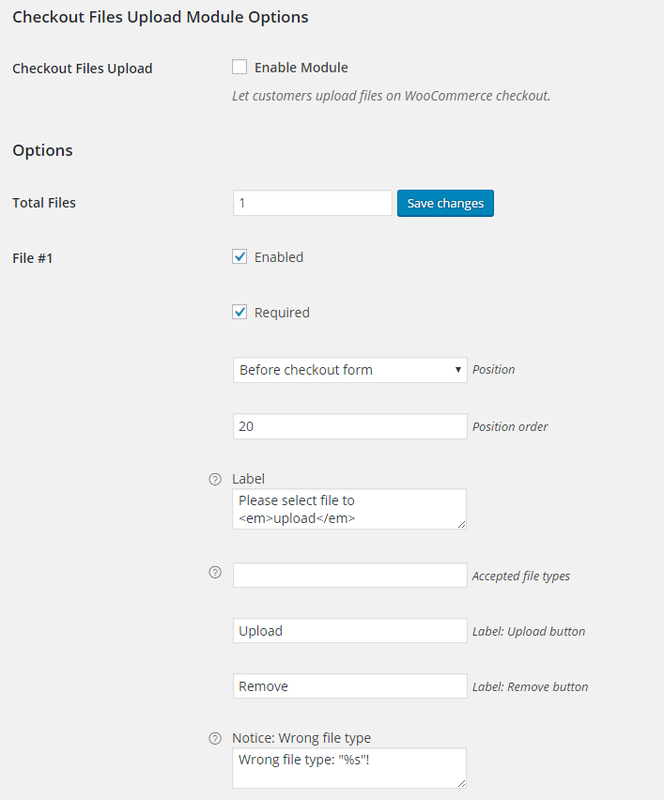 When enabled, WooCommerce Checkout Files Upload module lets you add multiple files uploads for customer on WooCommerce checkout page. Position on the checkout page. Label to show to the customer. Labels for Upload button and Remove button. Messages on wrong file type; required file; file successfully uploaded etc. Conditionally show field only if selected product or category or tag is in the cart. 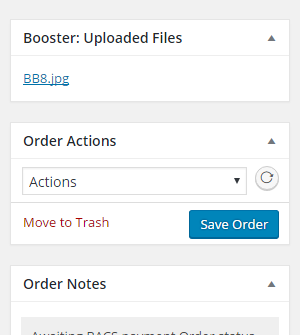 Customer uploaded files can be found on admin’s order edit page – in “Booster: Uploaded Files” metabox. Where do we find the uploads that customers upload? Is there anyway to make the upload happen after payment has been made to prevent spammers? Uploaded files can be found in admin’s order edit page. There is new metabox “Booster: Uploaded Files” – in the top right corner, right above standard “Order Actions” metabox. Regarding uploading files after payment – unfortunately not possible at the moment, but I’ve created new support ticket for that, will add it in next plugin update in about 2 weeks. Am I able to move this block manually in my template file? 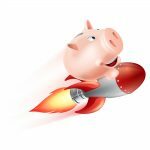 I made some modifications to the plugin – please download the development version here – http://booster.io/dev/. You will need to uninstall the old version first (don’t worry your saved settings won’t disappear). After that you can call wcj_add_files_upload_form_to_checkout_frontend() function in your template file to output checkout files upload form. Is there a way to resolve this issue? Thank you. Curious where I would look to move to position of the UPLOAD button? I would like to have the UPLOAD button BELOW the choose button. As is, this works fine on a desktop(larger)display, but on a mobile device the button does not display as it it ‘lost’ somewhere on the right that i can’t access. If I have this as a required element, my mobile users are ‘stuck’ as they can’t see/get to the UPLOAD button. Is there a way to allow multiple file uploads per product item, from the cart page?? Hi I am looking to use Booster for our site that accepts artwork submissions. We need to keep the original file name as well as the order number (currently the files are renamed for the order number). Hopefully order number followed by original filename, something like 4589_1_orginalfilename.jpg Is this possible? There also seems to be a problem with accessing the file on the order page in the editor, I click on the original filename in the “Booster: Uploaded Files” section, it downloads an html page and no image. Hi. I’m fairly new to WordPress. I activated this plugin, but I don’t know how to get it to show up on my product page. I’m selling custom printed fabric. I created drop downs for the amount of fabric the customer wants, but now I’m trying to use this module so that my customer can upload their image they want printed on the fabric. I cannot figure out how to get the file upload feature to show up on the product page so the customer can click the button to upload their file. Any help is greatly appreciated. I would like to be able to upload a file from the order overview screen in admin (like I can create an invoice or custom document). Is there a way to add a column in the admin orders panel that says if a file is uploaded or not? I don’t receive as attached file in email. Is it normal. I have to do something to have this option? Is there a way to adjust the file size rule to allow for a 500MB or greater file to be uploaded? I don’t see any settings for it. unfortunately is not possible at the moment. Can this upload option be placed on the product page? Please reply. Hi – can you tell me where the uploaded files are kept? I can’t seem to find where to download them from once uploaded into the site. Thanks. James. Unfortunately not at the moment but we have added it to our todo list. Sorry I have a problem I added the upload files in the thank you page and when I upload the file I receive a message “File was successfully uploaded” in the product page and not in the template itself. What is the solution? Can you share a screenshot of what you mean? Hello, is it possible to attach the WooCommerce Checkout Files Upload on a Custom Payment Gateway? We have staff that pay with a company form. Unfortunately you can only have checkout files upload field for all (or none) payment gateways at the moment. I have an issue with WooCommerce Checkout Files Upload. I use it on my site for uploading Word documents (.docx). It works perfectly fine as intended. But when I try to upload a file with the filename containing diacritics (e.g. ěščřžýáíé… so it would be name like “můj životopis.docx”) it does not upload anything. Can I fix it on my side (e.g. adjusting functions.php?) or what can I do to let my users upload such filenames? I have a problem with images uploaded through booster on check out. They are empty and have a size about 50k! There must either be something wrong with this module or be missing a setting? I have tried it with a FRESH WordPress, Woocommerce, Storefront, install. I am getting EMPTY files (75 bytes) on upload, both per email and in the Order-section. I have checked with my hosting-provider. I have tried some similar plugins functioning and they have a way to tell the plugin what UPLOAD-DIRECTORY to use. I would be happy to get Booster up working, and have used a lot of time doing a fresh installing to get it work. I have multiple file upload sections, three to be precise, and i configure only to show one. What can be the problem? Can you explain what is the problem that you are having? If you want your customers to be able to upload 3 files, you should have 3 file upload buttons. Since there’s finally someone replying here, I’ll try this again. I still need to be able to add files to an existing order from the admin area. For example: I build websites. A clients orders a website from me, so I put his order in WooCommerce and sent him an invoice for his down payment. A few days later, he emails me his logo and a word document with the text for his website. I would like to upload the logo and word document to that order from within the admin, so I have everything in one place. The client can already do that through his account area, but I need to be able to do that in the admin area as well. All I need is a link “add new file” in the booster uploaded files box. Thank you for your suggestion. We have added this to our todo list. I´m a teacher of photography and I would like to know if my students can upload their photographs after paying via paypal with this plugin. Your students will be able to upload their photos although it is not currently possible to limit file upload to payment methods, meaning if there are other payment methods available along with paypal, either one could be used. Is it possible with this plugin for a bulk upload or do you have to upload your files one by one? Unfortunately at the moment only 1 file can be uploaded per checkout file upload box but we have added bulk uploads to our todo list. At the moment, the module uploads the page by using POST, but in the checkout page doing this refreshes all the other fields that the user might have filled (We work with unregistered users). Is there any way to keep the values in the rest of the checkout fields?. I’m afraid there is no option for that yet but we have added it to our to-do list.